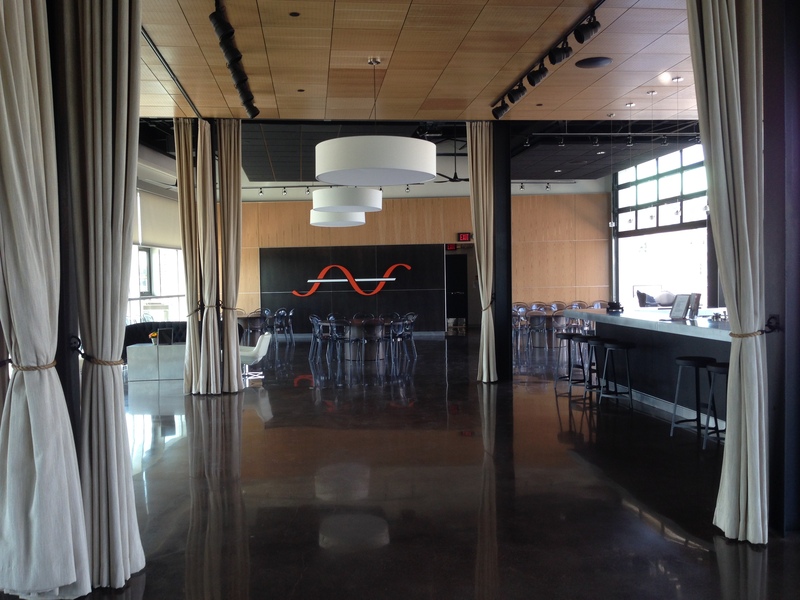 On Wednesday I got to attend a media sneak peek in the newly opened New Riff Distillery. I could tell as it was being constructed that it was going to be a beautiful facility with a lot of serious investment behind it. After talking with the production manager Jay Erisman and learning about the research, planning, and science that has gone into creating New Riff, I am firmly convinced that this will be a world-class distillery and treasure for local whiskey lovers. 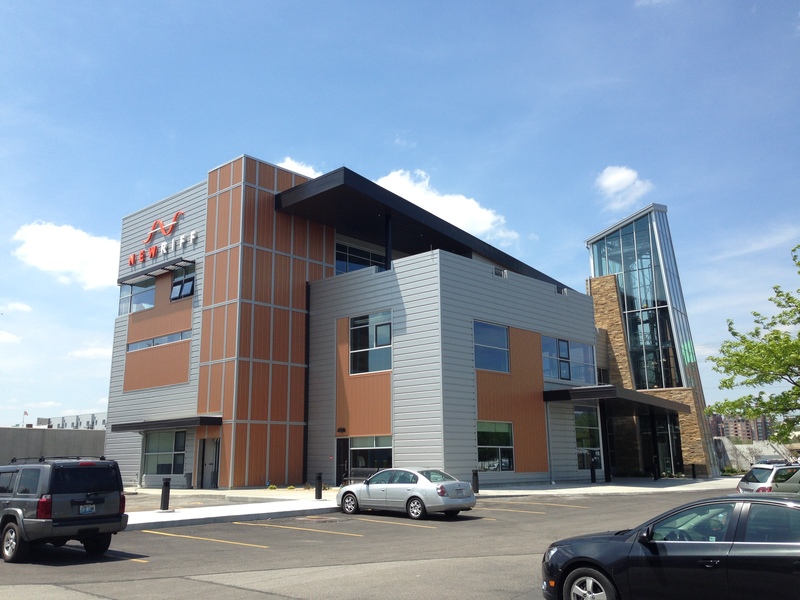 The outside of New Riff is impressive, with a glass tower showing off the 60 foot column still. Inside the copper was polished and ready for photos. The large glass windows, stone walls and urban location reminded me the Town Branch distillery in Lexington but as Jay walked me through the distillery it became clear that New Riff was going to be a very different distillery than Town Branch. To start with the equipment itself is different. 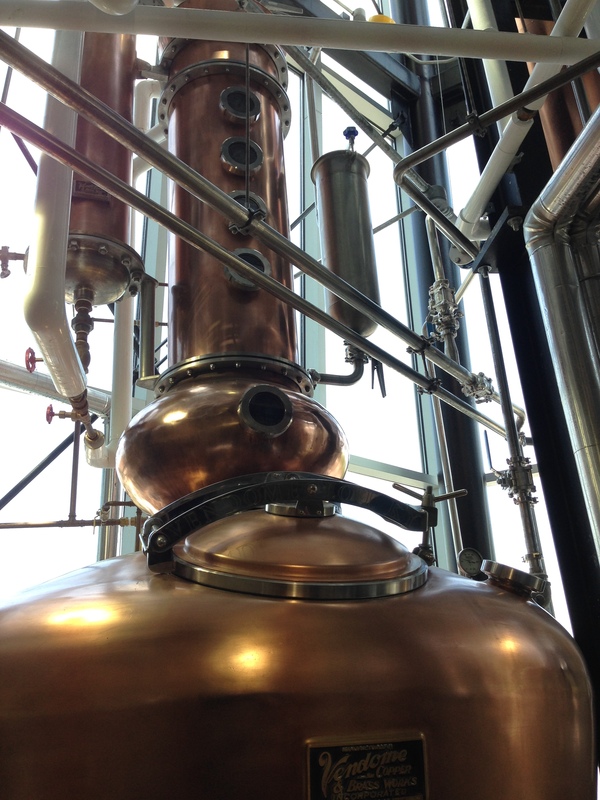 New Riff has both a column pot still so that they will be able to produce a variety of spirits, even adding some modifications to the traditional column still so that adjustments can be made to the distillation process at all levels. Jay pointed out over and over again little details they had adjusted or changed to ensure that they would be producing the highest level of whiskey they could. Everything from the angle of the mash tubs to the placement of the grain silos has been deliberately calculated, not just for the product they will start producing this week, but also for what they hope to be making ten years from now. 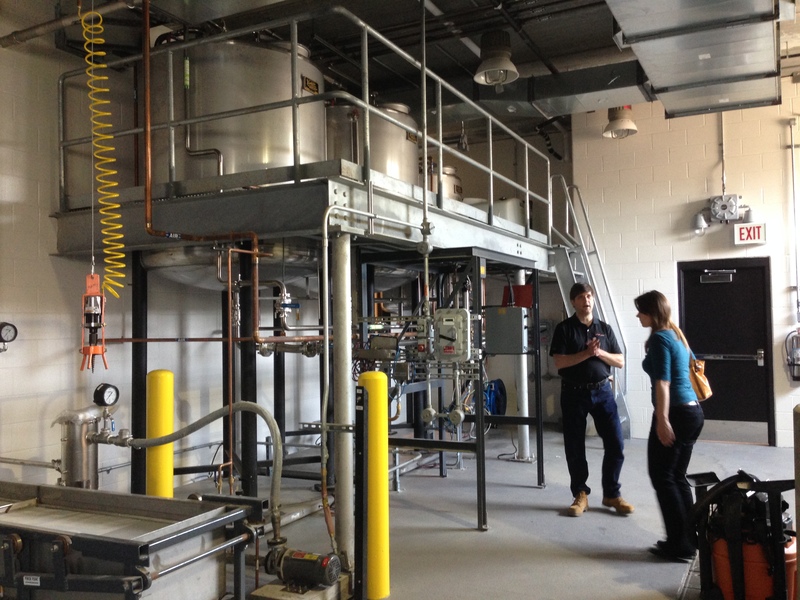 Everyone who is opening a new distillery has to create a story behind their brand. Many distilleries do this by telling you about their grandfather the moonshiner and the secret recipe he handed down. These stories are charming but often you find the facts don’t always add up when you scratch below the surface. That is why I was so impressed by New Riff’s attitude toward the outside resources they are using to get started. One resource in particular is the consultant who was instrumental in the development of New Riff, Larry Ebersold. Ebersold is the former master distiller at the MGP distillery in Lawrenceburg and Jay repeatedly credited him for his contributions to New Riff. And speaking of that Lawrenceburg distillery, that is also the source of the OKI Reserve bourbon that New Riff will begin selling this summer. Neither of these things, hiring a consultant or bottling a sourced bourbon, are at all unusual in the world of whiskey, but it is rare enough for a distillery to even admit doing it, let alone celebrate it. 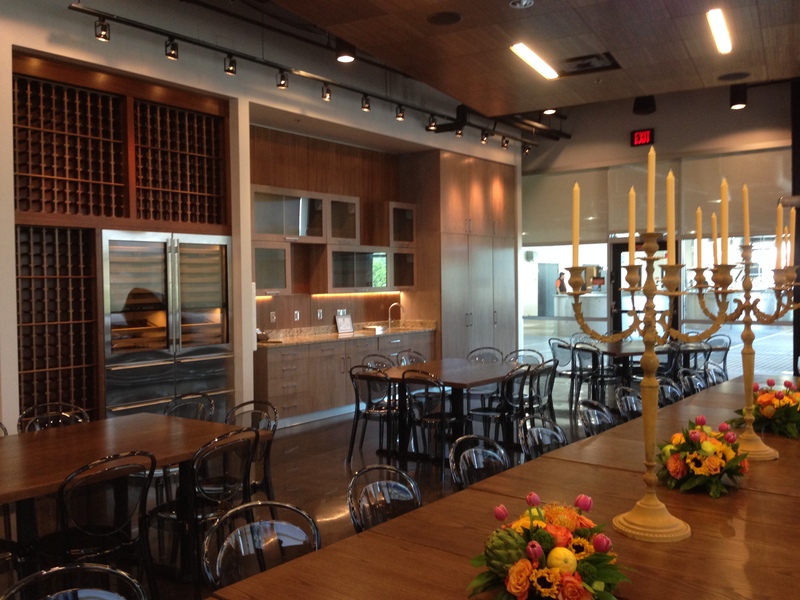 The Doubler Room can hold up to 50 people. Although small compared to other well-known bourbon producers, New Riff is large for a micro-distillery and even though they just opened their doors, they are planning for growth. In the meantime, while waiting for the barrels to age, you will be able to book one of their two beautiful event spaces for private events. You can also become a part of their innovative Ranger Program. Becoming a New Riff Ranger not only gives you a lifetime membership, a discount at the gift shop, and bragging rights, it allows entitles you to one personalized bottle of single barrel bourbon four years after you purchase your membership. Buy one for your friend’s wedding this summer and they can toast you with their bottle for their 4th anniversary. The Tower Room had a bar, outdoor patio, and can hold up to 150 people. Needless to say, I left New Riff feeling very excited. It is great to see that our area’s distilling history is starting to be revived alongside its brewing history. And may I say, well done to Ken Lewis. Bellevue now has the country’s largest beer and spirits store with a microbrewery and a distillery all in the same location. If he can just build a monorail to take you to each location he would be the Jungle Jim of the alcohol world. Sometimes craft beer is weird. Brewers of beer (or at least craft beer) are an inherently creative bunch. With brewers, like bakers, chefs, and pretty much anyone else who uses their noggins to turn a concept into a finished product, you’ll find that the concept itself is often as important as the process that leads to the finish product. And boy, oh boy, do the Quaff Bros. have some concepts. 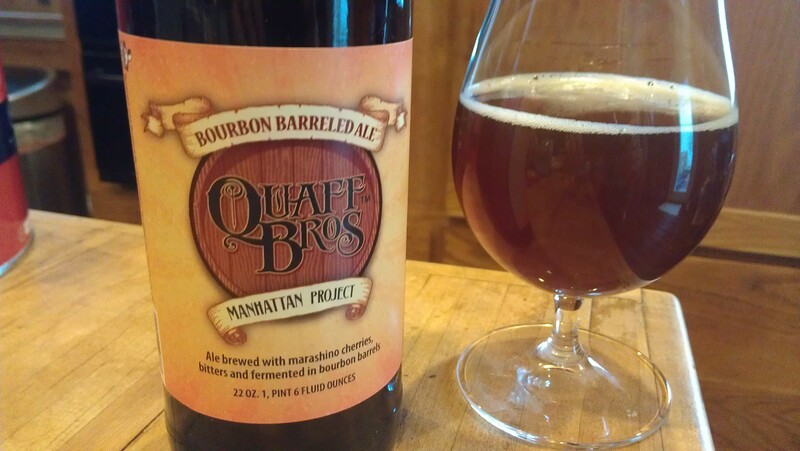 Strong – sour – barrel aged – stout- wheat – IPA, their creations run the gamut. I thought Sour Grapes (check out my review) was weird, but apparently I had seen nothing yet. Obviously, following a sour brown ale aged in bourbon barrels with wine grapes (yep), they release a beer that attempts to mimic a classic cocktail. Manhattan Project is a rye beer, aged in rye whiskey barrels with maraschino cherries and bitters. Like I said, craft beer is weird. Bourbon* and I are old friends. We first got to know each other back in my 20’s and we’ve been enjoying each other’s company ever since. Of course at first I thought bourbon was a little out of my league. I was intimidated by his reputation and some of his friends seemed a little cooler-than-thou if you know what I mean. But the more I get to know him, the more I liked bourbon. Sure we’ve had our ups and downs but I’ve forgiven him for the hangover from my 30th birthday and he’s forgotten all about how I used to mix him with coke. 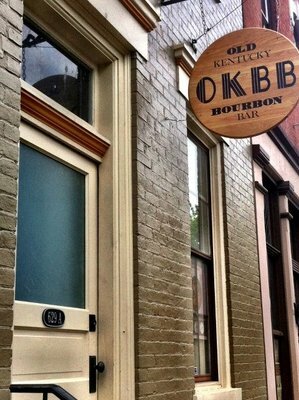 If you have yet to become acquainted with bourbon I can recommend no better place than the Old Kentucky Bourbon Bar on Main Street in Covington. This week marked my second visit to Molly Wellman’s new bar, dedicated to showcasing American whiskey of all kinds, but there is obviously a heavy focus on bourbon. The OKBB is small, clean, and modern looking on the inside. At no point during either of my visits was the bar crowded. That is probably because this is not really a bar in the typical sense of the word. It is hard to imagine a group of friends piling into the OKBB to mindlessly enjoy drinks while chatting about their week, let alone going there to pound back shots and get rowdy. This is not so much a bar as it is a museum that showcases one of the true American art forms: bourbon. You go to the OKBB to be educated and if you come out with a buzz, that’s just a happy coincidence. A flight of rye whiskey at the OKBB. I realize that this description is going to put off the vast majority of people reading it but I encourage you to give it a try anyway. The bartenders are incredibly knowledgable about the entire process of making, drinking, and mixing whiskey but they are also very approachable. On my first visit I was brought a tiny little cup of spring water and the bartender clearly read my confusion when he set it down next to my drink. He kindly asked if I would like a glass of water for drinking in addition to the one for mixing. If you don’t like the taste of whiskey by itself the staff knows many excellent cocktails, like the Horse’s Neck or the Manhattan, to give you a taste without overwhelming you. But if you do already enjoy bourbon this is a great location for discovering new things. On my first trip I got to try a selection of much older bourbon than I could usually afford. 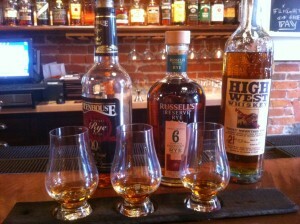 On this last trip I tried a flight of rye whiskey, something I’d had little experience with in the past. 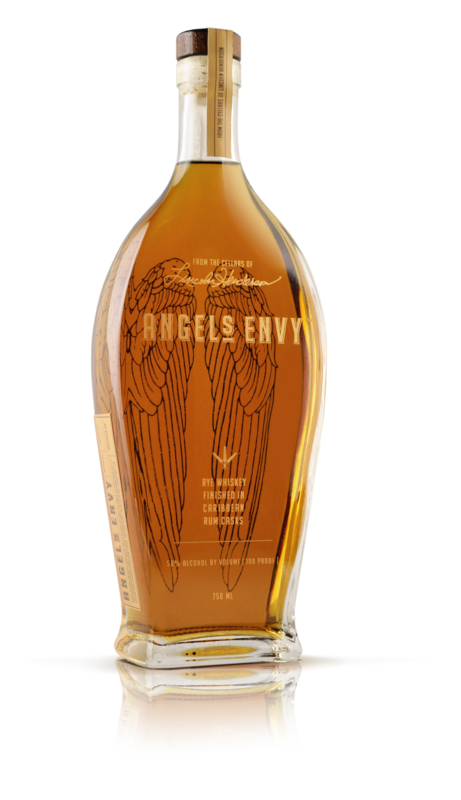 In addition to the top shelf bottles, the bartender was also very helpful in pointing out some good “everyday” bourbon that were surprisingly strong for their price. The quite atmosphere, talkative staff, and chance for trying new things together also makes the OKBB ideal for a date night. And speaking of price, that does bring us to the main downside of the OKBB and the reason why, despite my love of bourbon, I’ve only been there twice. It is not a cheap place. As I said earlier, this is not somewhere you go to get drunk. The pours have been described as small considering that they tend to start around $6 and quickly go up to $9 or more. In this case I think it is clear that you are paying for the knowledge of the staff as much as for the whiskey itself. It is a great place to go and invest a little money in order to increase you knowledge and to try small portions of expensive delights but it is something I save it for a special occasion. *I was reluctant to give bourbon a gender but the flow of the writing required it. So I went with the masculine but I think that an equally strong case can be made for going with the feminine. You can hear more about my trip to OKBB on last week’s episode of The Charlie Tonic Hour.